Jeff Mayfield is a firefighter and coroner in Madisonville/Hopkins County. How different would life in your community be without its teachers and school administrators, nurses and other health care workers, public safety officers and other first responders, and social workers? Thanks to Eastern Kentucky University and its thousands of graduates who have gone on to serve Kentucky communities in those professions and others so vital to our everyday quality of life, you’ll never face such a scenario. The profiles that follow can only begin to tell the story of the impact EKU graduates are making – in communities both large and small all across the Bluegrass State. Their venues of service may vary, but a common thread is unmistakable: a passion to serve others and make a positive difference. While that desire may have led them to their career choice and to Eastern, it was at EKU they honed the skills that so often make a life-and-death difference in the lives they touch. It might be their darkest of days but, when Jeff Mayfield, ’01, arrives on the scene, Madisonville residents know they’ve got a friend, advocate and devoted public servant at their side. Some are homeless. Some are reeling from drug abuse. Others might just need transportation to and from the doctor’s office. Whatever the need, as social work manager at St. Elizabeth Physicians in northern Kentucky, Ashley Cremeans, ’09, is there to lend a helping hand. Chad Higgins’ career track was sealed in sixth grade, when his teacher refused to let him fail as he struggled with his parents’ divorce. Higgins also serves the community through his work as director of music and media at Consolidated Baptist Church, recalling the lessons he learned during his two years at EKU. A flight paramedic who provides critical care transport in southeastern Kentucky and parts of Virginia, Tennessee and North Carolina, Bentley got his start with the Neon (Kentucky) Volunteer Fire Department. That was his introduction to EMS, and he was soon pursuing a degree in emergency medical care at Eastern. When he returned home, only two paramedics were working full time in Letcher County. Bentley has been very active teaching EMT and paramedic courses as well as precepting new hires. “I’m a talker and love to interact with people on scenes and teaching classes.” His love for people extends to occasional free clinics and “Santa runs” with the helicopter. That has been the mantra for Carmen Griffith, ’91, ever since she followed the footsteps of other family members into the health care profession. Today, Griffith serves as vascular coordinator for Kentucky One Health-Jewish Hospital in Louisville. She collects and examines data, presents paths for improvement to vascular surgeons and others, works with other data managers within the Pathways M2S network, organizes events to raise awareness about vascular disease and aortic emergencies, and attends conferences that include physicians, data managers, nurses and researchers in order to share knowledge and establish regional goals. Note: This article appears in the Fall 2017 issue of EKU Magazine. This is just one of many great stories featured in the latest issue of EKU Magazine, our twice-yearly alumni publication. View the Fall 2017 issue. Once you’ve read it, please give us your feedback. 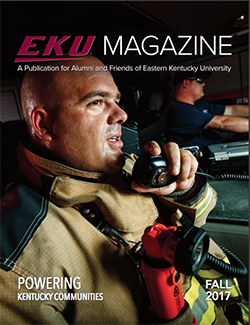 We’d love to hear your suggestions for how we can make EKU Magazine even better.